Located in the heart of Southeast Michigan, Hazel Park sits at the intersection of the tri-county area, offering immediate access to Metro Detroit’s businesses, attractions, sporting events and night life. 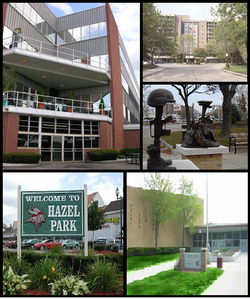 Take time to explore Hazel Park, an affordable, family-friendly community. It’s a great place to live, work or visit. It’s this unique, small town charm coupled with a suburban vitality that defines us. Be it the Hazel Park Ice Arena or the Raceway, which has been in operation for more than sixty years, our city is a great place to visit and an even better place to live. Source: Official Website of Hazel Park, MI. Copyright © 2015 (Hazel Park, MI). All Rights Reserved.